Everywhere you look there is someone sporting a flash of red on their wrist nowadays. And every culture has developed some sort of claim to its origins in very different manners. rom the Hindu traditions to the mystical holding of the Kabbalistic Jews, red strings are everywhere. 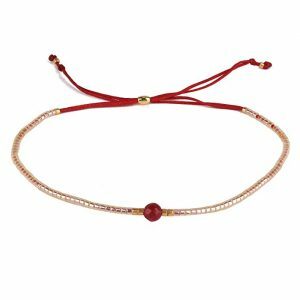 Not ones to miss out on a trend, we have found ten red string bracelets we hope will bring us a little luck. As a bonus, these pieces are a bit more stylized than just a piece of red string. Some of these are so beautiful they would look good as solo bracelets as opposed to the layered effect most red string bracelets end up in. We have shared them with you with the same hope of luck and good looks! We will start with a double whammy of talismans against ill-wishes and poor luck. This red string bracelet clings to a crystal-encrusted evil eye charm. An evil eye charm is a direct combatant against evil eye curses. It is thought, particular in Indian and Near Eastern traditions that an evil eye curse cannot be cast if the caster is being watched. The evil eye charm stares back into the curse and frightens it away. 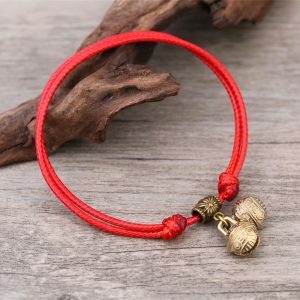 Combine with the good luck brought by the color red and the additional protection of the red string bracelet, this could be a powerful bracelet that will make your day just that much better. Secured with a sliding knot, the bracelet is adjustable both for size and fit. We prefer this particular bracelet worn a bit on the snug side so the evil eye charm stays on solid display. Not only do you reap any power the charm may hold, but you keep a gorgeous piece of shine front and center. White and blue crystals sparkle brilliantly from a pale yellow gold tone alloy. No need to bury this in a layered look. This bracelet is charming enough to be on display all by itself. 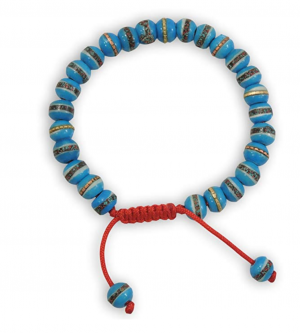 Take a red string bracelet with all its lore and luck, add the calming peacefulness of Tibetan monks and a couple of layered knot bracelets and you have our next selection. 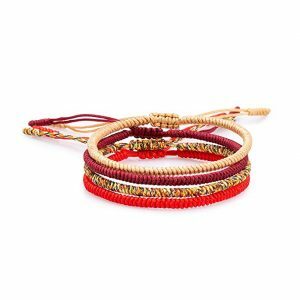 A collection of four perfectly curated knotted bracelets with the red string on prominenet display. 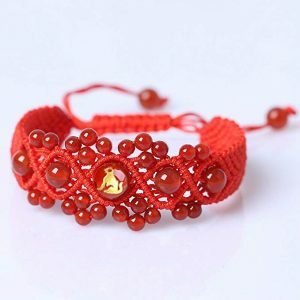 In many traditions, nots are an important part of the red string bracelet. This takes that concept straight up to the highest heights. Handmade by Tibeten monks, these four come in an automatic layered look. Wear all four or just the red string, depending on your mood and ensemble. Each is adjustable and remind us of those friendship bracelets we used to exchanges as kids. You can keep all four or treat them as a grownup set of friendship bracelets, passing them out to people you love. It is a touching gesture for care and mutual appreciation. A lovely taupe, a deep maroon, a prismatic rainbow, and the classic bright red strings are knotted into a wonderfully matched set. Wear just the four in the set or pair them with other natural fibers and leathers for a very down to earth feel. We love the two shades of red when combined with the chocolates and siennas of leather cuffs. Red is a lucky color in Chinese tradition. Chinese knotting is an ancient tradition that stretches back to the tenth century. The Chinese zodiac stretches back even further than that. Our next pick with a stunning combination of all of this. Ruby red agate beads are masterfully incorporated in traditional Chinese decorative knots. The diamondesque pattern is instantly unmistakable. In the center of the bracelet is a bead that displays a gold Chinese zodiac figure of your choice. Select your chinese zodiac to proudly proclaim your actual spirit animal. With the Chinese New Year just recently passed, it has begun the Year of the Pig. Select this one to capitalize on everything the red string bracelets have to offer plus all the promised luck and good fortune of the pig, and this is pretty much a must have. It does not hurt at all that the bracelet is beyond beautiful. Most red string bracelets are not going to hold up to evening wear standards for us, but this is a notable exception. We love this bracelet paired with a velvet black dress that shows off a little leg. Carry the theme through with a pair of red stilettos and an Asian-inspired clutch. 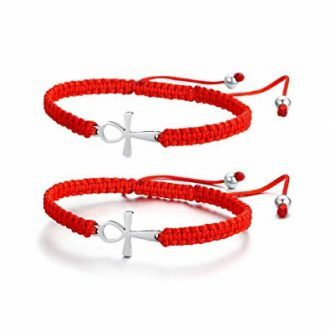 If all the myticism and woo of red string bracelets verges on overmuch for you, you may prefer a simple knotted bracelet like this one featuring a stainless steel cross. It is pretty straightforward as far as styling goes. A knotwork patterns the feels a bit like the emergency preparedness paracord bracelets and a silver-toned cross. The tails of the adjustable bracelet are capped with two silver beads. This is an example of a bracelet that has one job and does it well. For those of the Christian faith, this is also a great daily wear piece. The cross is, traditionally, a symbol for both Protestants and Catholics alike. It is a symbol of the sacrifice Jesus Christ made for all of humanity with his death at the hands of Roman and Jewish persecutors. Christians wear the cross to remind themselves of that sacrifice and its impact on their lives of faith. Use this as part of a layered look to add a pop of red with your other bracelets. The red string brings it to the forefront of any layered look. We love the texture all the knotwork adds to the look as well. We love the hybrid design of this bracelet. A traditional chain bracelet is expertly crossed with a simple red string racelet in this hand made creation by California artisans Alef Bet. The red string is woven between each of the chain links. This lends a braided effect that is both simple and astonishingly creative. Add to all that a dainty little hand of hamsa charm and you are pretty set with a cute and purposeful bracelet. The hand of hamsa is related to the evil eye. Popular in North Africa and the Middle East, the hand features an eye inset in the palm. This eye watches for the evil eye spirits and wards them off. The red string is of course a protectant all its own plus a source of luck. And who does not love a good splash of silver? Additionally, this purchase supports jewelry artists who trade in handmade goods. Our favorite designers all had to start somewhere including Kendra Scott and Alex and Ani’s Carolyn Rafaelian. You might just be buying a first release piece of designers who will one day run an empire. 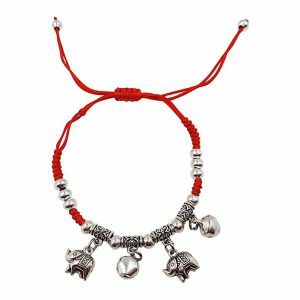 Another one stop shop for all your luck needs, this knotted red string bracelet features two elephant charms and two silver bells. The adjustable knotted closure means this is perfect as a bracelet or an anklet. For Buddhists the ousnd of the bell is the sound of wisdom and clarity. Everything from the tiny tinkles of ankle bracelets to the deep resounding gongs evokes knowledge and the patience to receive it. For this Hindu beliefs, the goddess, Saraswati, the bringer of knowledge and wisdom, is associated with the bell. The shape of the bell is also often said to represent Ananta, the celestial snake on which Vishnu reclines. According to Christian mythology, the sound of a bell is akin to the voice of god. Elephants are also said to be brings of luck, wealth, and good fortune. So in one bracelet you are warded from ill-wishes, inviting luck and wealth, and evoking the spirits of knowledge and wisdom. Sounds good to us. This one is just a little more subtle than some of our previous selections. A good part of the red cord is hidden underneath a layer of beads. We are unsure if that undoes the mystical energies of the red string bracelet, but we still love this option. A single row of opalescent Japanese seed beads encases a red nylon cord. Two tiny little gold seed beads cap each end of the row. A faceted stone of red jasper sits in the middle of the row and perfectly mirrors the pop of red that will be underneath your wrist. This is another one of those pieces that can work in a layered bracelet ensemble or can rock it solo. While it is pretty dainty, the iridescent shine of the seed beads paired with the emboldened red of the jasper give it a certain presence. Red and turquoise go together like peanut butter and jelly or macaroni and cheese. The pairing is so delicious almost no one will turn it down. This bracelet features a crescent moon encrusted with turquoise colored rhinestones. The arms of the moon clutch a star studded with white crystals. The charm is strung from a red string bracelet. While most often associated with the faith of Islam, the moon and star presented together dates back all the way to Ancient Greece in the written record. A common feature in astrology, the moon and stars are importan elements in the practice. The days the moon moves through their astrological star position is an important and empowering day for those who follow the practice. We recommend this one as part of a layered look. Pair it with other pieces featuring red, rose gold, white gold, and turquoise for a nice chunky, boho look. Or wear it with a collection of silver-toned wire bangles to add a pop of color to a monochrome look. This is our second pick were a bulk of the red string is actually underneath a series of beads. While we are quite sure this is against the strictest Kabbala traditions, we are pretty sure jewelry has the energy you permit it. Red is still the color of luck and happiness in the the Chinese traditions. And this red string bracelet is coated in Tibetan mala beads for added assurance. It is also our second recommendation that matches airy turquoise with red. We cannot help it. The combo really is just stunning. Mala beads are wonderful for keeping yourself collected and centered. Traditionally they are a necklace used in meditation but the smooth spheres can also work in bracelet form as a type of prayer bead or focus for nervous energy. Wear this piece solo on one hand and a collection of layered cord and leather bracelets opposite it for a very free-spirited look. 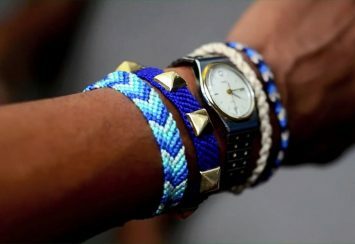 Or pair it with other beaded bracelets to blend it into the crowd so to speak. 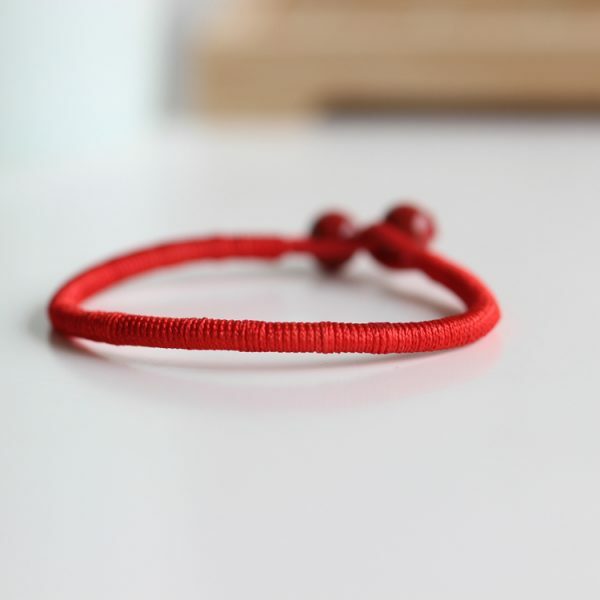 Our final selection is just the standard red string bracelet. Strands of wool, dyed red with traditional techniques and blessed at the tomb of the biblical Rachel, these meet all the standards for Kabbala use. You can use these to add a pop of color and we absolutely love them for festival season in conjunction with all your concert and event bands. By the nature of their symbolism and power, red string bracelets are designed to be daily wear items. They are not so much as adornments as most jewelry is, rather talismans and harnesses of ethereal power. They are not meant to match or complement an outfit. You wear them for the good luck and fortune they bring. Or you wear them to help sheild off ill-wishes and misfortune. Several of our selections go above just a length of knotted red wool therefore may not look well with every outfit. If you are wanting to truly exercise the spiritual aspects of the red string legends, our list is a great complement to the traditional red strings but should not be viewed as alternatives. In both the Hindu and Kabbala traditions (discussed below), how you don the red string bracelets and the manner in which they are worn can have an effect on their efficacy. Because of this our list is meant to enhance rather than replace. Take our above style notes with a grain of salt if this is something you are including in your spiritual practices. While most celebrities wear jewelry fully aware a paparazzi lens is just behind the next set of bushes, the red string trend seems to be more of a personal philosophy. They do not seem to mind being spotted with their red bracelets at all. While there are several deep and mystic meanings tied to red string bracelets, it does not seem that all of the celebrity wearers follow them too closely. It may be a part of their spiritual journey. It may be just a trendy lucky charm. Either way, there are a ton of famous folks adding a pop of red to their going-out clothes. Many celebrities have been spotted with everything from simple lengths of cord to more complex designs hiding among their daily look. Rihanna regularly wears a simple cord as she goes about her day. Pop icons Michael Jackson and Madonna are tied together through their love of the red string. Beyonce, Paris Hilton, Ashton Kutcher, Britney Spears, Harry Styles, Zac Effron and so many, many more have all been snapped with a bright red string wrapped around their arm. James Van Der Beek even goes the extra mile and keeps a length of lucky, protective red wrapped around his toddler’s, Joshua, wrist. Even stars who have not exactly jumped on board with the Kabbalah mysticism surrounding the scarlet ropes have been spotted with them on. Leonardo DiCaprio is chief among this list.While he is neither Jewish nor particularly religious, his love of the trend even carried onto the red carpet. 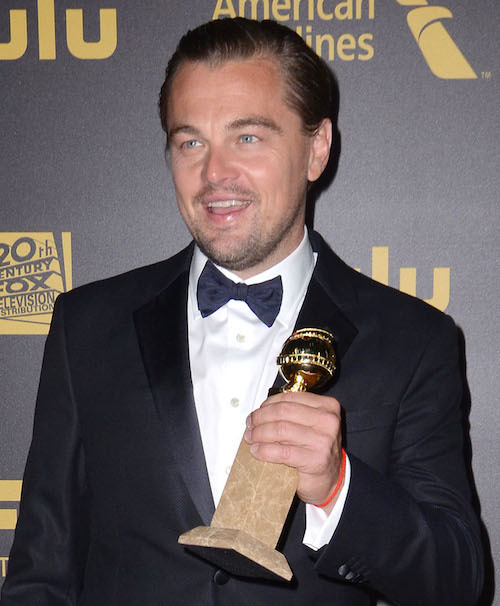 Most stars end up forsaking the tradition when it comes to premiere nights and award shows. The red bracelets get left at home in favor of lusher looks. Not Leo, though. He walked himself onto the red carpet at the 2016 Golden Globes and added just a bit more red to the walkway with his red bracelet peeking out from underneath his immaculate cuff. Because it is very easy for children to be admired too much, talismans and wards against the evil eye curses are thought to be vital for children. In many Indian, Hindu, Jewish, and other Eurasian religious beliefs, children must be protected from accidental curses. Babies are often adorned with red strings and evil eye beads. Madonna, Michael Jackson, and James Van Der Beek took this precaution to heart. All of their children were equipped with and protected by bits of red string. And who can blame them for trying? Kids are naturally adorable and often watched with admiration. Since this can be the root of the evil eye curses, it stands to reason a bit of protection might not be amiss. First, and most popular at current, is the Kabbalah Jewish tradition of the red string. Kabbalah is the mystical interpretation of the Jewish faith and scripture. It is an important element in Hasidism. Overall it is a remarkably complex belief system born of Hebrew oral tradition, Hebrew scripture, and their own texts. One single element of this broad, winding mythology is the red string. It comes from Genesis, chapter thirty-eight of the Jewish Torah. (Consequently, this is also the same in the Christian and Muslim scriptures as well.) It ties to the story of Jacob and Rachel and the birth of their twin boys, eventually named Pharez and Zarah. A red string was tied around one twins wrist during the birth. Kabbalah interpretations have found significance in this act. 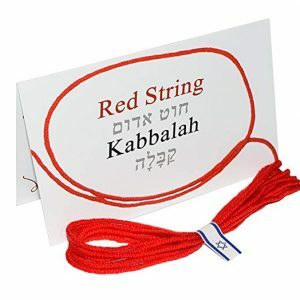 In Kabbalah, for the protection and luck the red string offers, it must be a wool cord. The wear must tie seven knots during a specific prayer. This is a blessing given over his sons by Jacob after their birth. Called the Ben Porat Prayer, it is in Hebrew. We have written it phonetically here. Ayin alei porat ben Yosef porat benyivarech ra mikol oti hagoel hamalachshmi bahem vyikare han’arim etvYitzchak Avraham avotai vshemha’aretz b’kerev larov v’yidgu. More modern applications of the red string prescribe that you have a person you love to tie the string around your left wrist, completing seven knots during the process. This offers protection against those that would wound you with envy. Alternatively, you can go to a Kabbalah Center near you and one of the teachers there can assist in tying the bracelet on. According to Kabbalah tradition, not just any red string will do. It must be a specific length of wool, dyed red in a traditional manner. It must then be wound around the gravesite of the matriarch of the belief system, Rachel. Failing to use a string created and blessed in the manner will result in nothing more than the regular wearing of a red string. The protection and lore of the red string are closely related to the Evil Eye. It is believed you can be cursed by someone looking at you with envy or jealousy. Their negative feelings and covetous eye cause ill-luck to fall upon you. You can even be accidentally cursed if someone watches you with overmuch admiration. 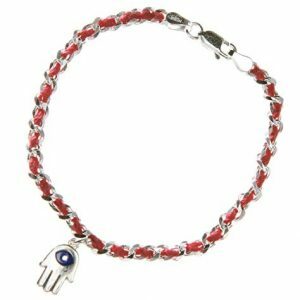 Talismans such as the evil eye beads, the hand of the hamsa, and red string bracelets can protect against these curses. 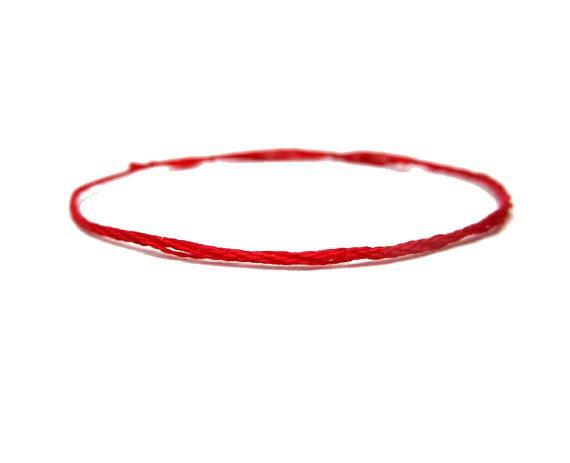 In the Hindu faith, a red string bracelet is called a kalava. Truthfully, depending on which branch or sect of the religion you reference, the red string bracelet has a few different names and even color variations. Some bracelets are a wonderful ombre between brilliant red and warm yellow. The strings are dyed with the precious saffron to achieve the gorgeous coloration. 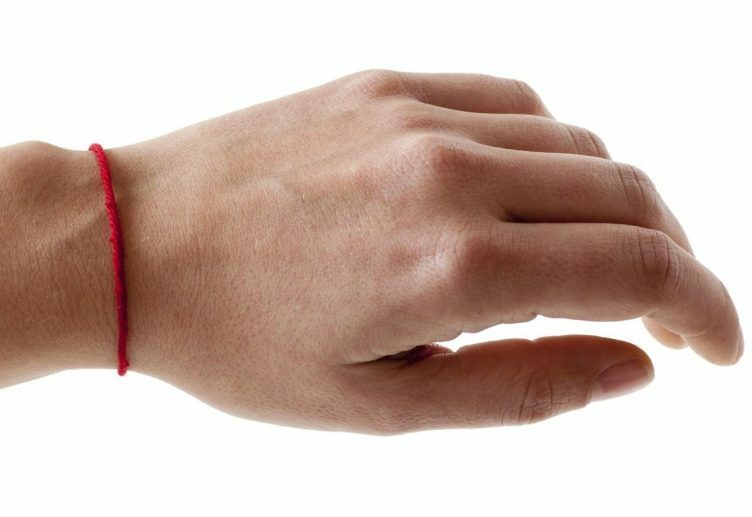 In the Vaishnavism tradition of Hinduism, a red bracelet represents the god Vishnu for men. Vishnu is the preserver of the world and universe, one of three gods in one being in the Hindu tradition. For women, it is for the goddess Lakshmi. Lakshmi is the consort of the god Vishnu and the goddess of wealth and purity. It makes sense that a husband and wife would want to evoke these gods together. In Chinese culture, red is a significant color. It symbolizes joy and happiness. Occasionally certain sources will also reference it as a good luck color. Since it is such a happy color, it is strictly forbidden at funerals. Additionally, the names of the dead are traditionally written in red ink on cards at the funeral. Therefore it is considered extremely disrespectful and horribly unlucky to write someone’s name in red. It is, essentially, akin to wishing death upon them. While Western cultures picture brides in a cloud of white, Indian brides often wear red in traditional ceremonies. In the Hindu belief system, astrology is important. The planet that governs marriage and relationships is the Red Planet, Mars. The color red is connected to love, passion, and new beginnings. These are the very foundation of a solid marriage. Thus, brides are encouraged to wear red on the day of their wedding. It is believed to bring prosperity, fertility, and happiness to the marriage. Once married a woman may change the color of her bindi as well, or the small, culturally significant dot worn on the forehead. A black bindi signifies a single woman. A red bindi indicates the wearer is married. Indian grooms also tend to wear red as, for men, red is the color of strength and virility, desirable traits in a new husband. In Ancient Egypt, red held mixed connotations. One representation of the fiery color said that is was the color of life and victory. Called desher in the language of the ancient Egyptians, many Egyptians wore pendants made of cornelian, a deep red stone common to the region. However, on the other hand, it was also associated with rage and anger. To have a red heart in Ancient Egypt was to be so full of rage you could not see straight. Other African cultures have varying relationships with the color red. In West Africa, red is often incorporated into the making of the culturally significant kente cloth. It symbolizes the blood spilled during periods of struggle and growth. It is associated with strength, as well as political moods. Nigeria takes a darker stance on the color, assigning it to death. However, as opposed to the Chinese treatment of red at funerals, mourners are expected to wear red.